NoorSaaz members Nathan Dillon, Mavrothis T. Kontanis, Monika Jalili, Timothy Quigley and Megan Weeder pose for the camera. Washington -- An operatic voice sings of love lost and love found in a language unfamiliar to many in the audience and even to some members of the band. Monika Jalili and her group NoorSaaz are Americans who sing their own interpretations of Persian folk songs and popular music from the 1940s through the 1970s. The NoorSaaz fan base is mostly Persian, and many concertgoers initially are surprised by Jalili's soaring voice and her ability to sing -- and correctly interpret -- Persian songs. "She has a wonderful voice. A tinge of accent gives it a quality that's very interesting," said one audience member following a June 7 concert at American University's Kay Spiritual Life Center in Washington. 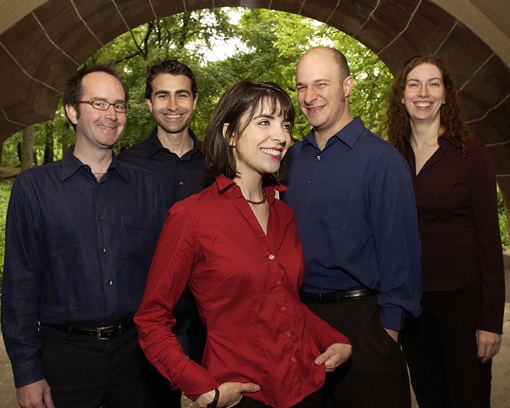 Jalili, a native New Yorker, is a classically trained vocalist who studied at the Manhattan School of Music. She began singing in Persian after meeting an Iranian music instructor through a friend. He invited her to perform at a festival in Long Island, New York, to celebrate the Persian New Year, known as Nowrouz. "I just fell in love with the music and the poetry, and I try to make it my own," said Jalili in a recent interview with America.gov. "My [husband's] family loved it, and they began suggesting other songs." Her husband, Reza Jalili, is Iranian. After singing for family and friends, she realized she wanted to sing in Persian as a full-time job, so she advertised on Craigslist for a band -- and it worked. Craigslist is a Web site used by Americans to find almost anything -- apartments, used furniture and band mates. Violinist Megan Weeder had played Persian music with a group in Indiana before moving to New York City. She answered Jalili's ad, and the band NoorSaaz was formed in 2004. In addition to Weeder and Jalili, the band includes drummer Timothy Quigley, guitarist Nathan Dillon and oud player Mavrothis T. Kontanis. (An oud is the Middle Eastern version of a lute). NoorSaaz is the Persian term for "light creator," and the word "saaz" also can mean "musical instrument." The show at American University was attended mostly by Iranians or by those of Persian descent. For the young, it reminded them of their families and songs they heard as children. For their elders, it reminded them of home. After Jalili sang "My Sweet Beloved Mariam," the crowd exploded into thunderous applause. "The songs were like old Chinese songs. It reconfirmed to me that music is international," said one Chinese American who attended the concert with Persian friends. "I loved her translations," said an audience member of Iranian background. "If non-Persians understand, that's a plus." The occasional translation into English or French makes the Persian love ballads accessible to a wider audience, but the band's love for Persia's culture and music shines through in each performance. "We try to bring the music to non-Persians. We're Americans and we put our own spin on it, but we still respect the music," said Weeder. The response from non-Persians has been very rewarding, she added. "It's been a great journey," said Jalili, commenting on the success of NoorSaaz. The concert was sponsored by the Foundation for Iranian Studies, a nonprofit organization whose mission is to "preserve, study and transmit Iran's cultural heritage, and to conduct and support research in the field of Iranian studies," according to its brochure. NoorSaaz performed again at a festival in Fairfax, Virginia, on June 24, and will return to Washington at a later date to perform at the John F. Kennedy Center for the Performing Arts.